Milan – Cisalpine Gaul or Northern Italy? The cavernous interior of Milan Centrale. Milan is rich, Milan is big, and Milan wants you to know all about it. The gradual change in Italy that I’d noticed on my northward trek from Palermo to Naples to Rimini came to its natural conclusion in the shadow of the Alps. Milan feels so different to the rest of Italy that I’d encountered that it’s a different brand of Italian entirely: chic, wealthy and engaged with the rest of Europe. The Romans called this area Cisalpine Gaul, connecting it more to France (Transalpine Gaul) than to Italia. That reasoning could still stand. The unification of Italy under Vittorio Emanuele was an union of states that hadn’t been unified since the time of the Romans. Sicily and Naples were Mediterranean-facing and had been dealing with foreign rulers for centuries. Rome was the Papacy’s domain, and the surrounding Papal States marked a border between north and south. As for the city states of Northern Italy—Genoa, Venice, Florence, Milan, etc.—they managed to maintain on-off independence even as they served as a battleground in the intrigues between France and the Holy Roman Empire. Looking like the world’s most expensive wedding cake. There’s something of this mingling still at work in Milan. A mix of Italian and Northern influences—a pride in being Milanese and an openness to the outside on terms strictly set out by Milan itself. The famous Galleria Vittorio Emanuele I is the prime example of this: an ultra-chic shopping arcade, dominated by high-fashion outlets, almost all of them Italian. Stand in the middle and you can see the Piazza del Duomo at one end, a statue of Leonardo Da Vinci at another, and a McDonalds’ (exiled to a street across the road) at a third. Milan just feels different. At least in the parts of it I walked through, there’s none of the narrow alleys and abandoned or crumbling buildings that I saw further south. Milan is just as old as those cities—the layout of the city still follows the ancient walls, and the city itself is dominated by the Duomo and the gigantic Castel Sforza—but it wears that age more lightly. There’s more modern sheen than there is ancient dust. The main tower of Castle Sforza. Sadly – yes – closed on the day. Usually, such a polishing of history makes me less sympathetic to a city, but I really liked Milan. There’s something very open and everyday about its blend of Mediterranean sunshine and Northern European business. Unfortunately for me, I’d arrived in Milan on Sunday evening and was spending all of Monday exploring. Which is my one piece of advice for this city: if you have to spend one day here, don’t make it a Monday. Everything is closed. Well, not quite everything. I enjoyed spending time in and around the massive and ornate Duomo, enjoying the pillared interior, which I’m sure was an inspiration for the Great Hall of Moria in the Lord of the Rings movies, and the roof terrace, which I reached after a long walk up some very narrow stairs. From the roof, you could see the Alps clearly in the distance, and it was nice to get a glimpse of the place I’d be heading next. Off in the distance, the Alps await. Still, there were things that I’d really wanted to see in Milan, and most of those were closed. The archaeological museum and the church and monastery it was sited beside? Closed. The refectory of Santa Maria delle Grazie, which held Leonardo Da Vinci’s Last Supper? Closed. The museums of Castel Sforza? Closed. The Planetarium and Natural History museum in the Giardina Publicca Indro Montanelli? Closed. Alright, so those last two were targets of opportunity as I was enjoying a stroll through the gardens, but you get the point. Still, even if all you’re getting to do in Milan is to stroll around the city, it’s well worth the visit. Though you should also bear in mind that a lot of the trattorias close between 3pm and 7pm. (Seriously, this was a weird day of missing out on things.) Milan is its own place, and by a distance the least touristy of the cities that I’ve been to on this trip. Come along and spend your money, it says, but if it’s touristy stuff you’re looking for, you’re going to have to search for it. That kind of thing doesn’t really mesh with our self-image. I’d say the climb was worth it, but I used the lift. The vagaries of modern-day cut-price flying being what they are, you will, on occasion, find yourself with hours to waste on a layover in some spot halfway between a distant departure point and home. That being the case, there are probably worse places to spend said hours in than Italy, and more specifically Bergamo. Having been dropped off by WizzAir (comfy and punctual) and having 13 hours before hopping onboard Ryanair (cramped and delayed), I was pretty happy to be no more than a short bus ride away from the medieval Citta Alta, with its massive walls and narrow streets. Chapel Colleoni in the foreground, basilica in the back. Inside there’s less to choose between them. As pleasant as it is to sit in San Vigilo and enjoy the view, the Citta Alta is the main draw, and it’s worth your time to descend. 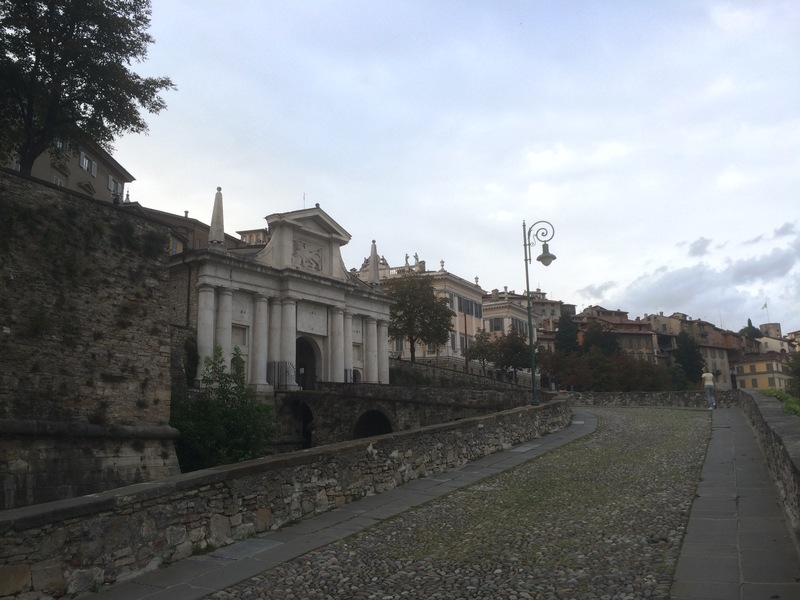 Possessed by the Venetians for more than 350 years, Bergamo was their western outpost against the rival great Northern Italian power and was massively fortified as a result. The Venetian walls still surround the Citta Alta, and the winged lions of St Mark, symbol of the Venetian Republic, still stand guard over the fortified gates. Yet Bergamo itself is far older than the Venetian occupation and there are buildings in the Citta Alta that are closer to 1,000 years old than 500. Perhaps the most impressive is the Basilica di Santa Maria Maggiore. Dating to 1137 but built on the site of a 7th-century religious edifice, it’s not so imposing on the outside as the Cappella Colleoni, the massive tomb of the condottiere Bartolomeo Colleoni annexed to it, but the interior is spectacular, with tapestries and frescoes adorning that walls and further frescoes and other adornments stretching all the way to the roof. Not that the Cappella Colleoni should be missed either – it’s a masterwork in its own right, and Colleoni’s heraldic symbol of three testicles on the gates have been rubbed to a shine by tourists and locals seeking some of his luck. One of the Venetian “lion gates”, with an elevated walkway approaching it. The museums are nothing to sneeze at either – I didn’t make it to the art galleries lying outside the eastern gate, but the Piazza della Citadella contains both the Archaeological Museum and the Museum of Natural Science. The former has some fine relics of the millennia of habitation in the area, from the palaeolithic through the Celts and Romans to more recent times. 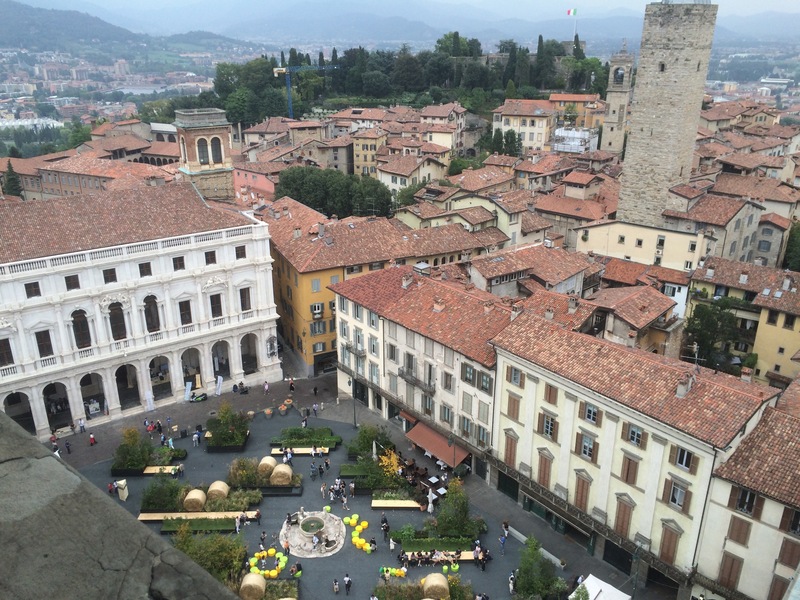 The latter sprawls all around the piazza and has an impressive section on other cultures. Closer to the Basilica, the Torre campanaria di città alta or old bell tower is worth climbing, and its attached museum has a fine interactive section on the medieval history of Bergamo itself. Don’t expect much in the way of non-Italian language help though. 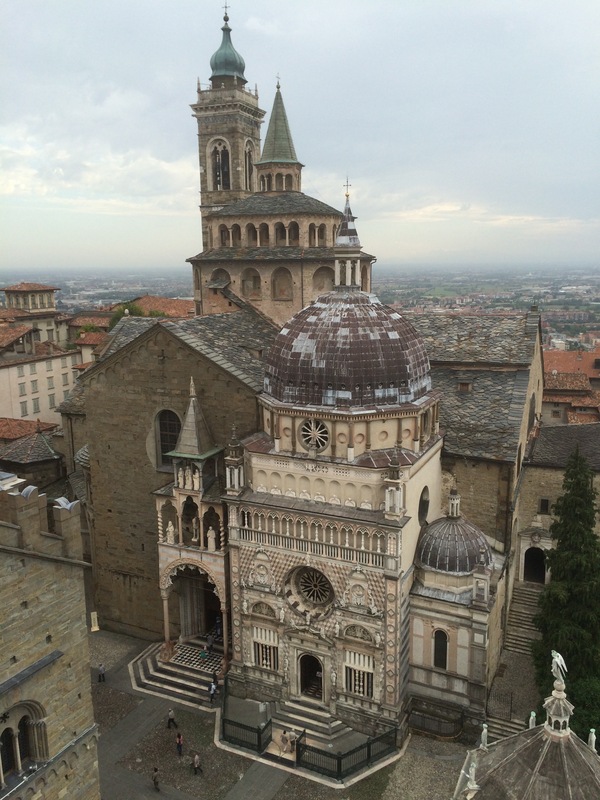 Beyond all of the attractions though, the beauty of Bergamo lies in the ability to wander the narrow streets of the Citta Alta freely, medieval buildings towering to either side and cobbles packed tight under your feet. Enjoy a gelato, or perhaps a beer or wine, and find a place to sit and soak in the atmosphere. And then, when the hours have spun past at last, descend though one of the Venetian gates into the Citta bassa and make your way to the airport. The final flight on that cut-price carrier may depress your spirits, but it won’t erase those hours stolen in the Lombard sunshine.